LONDON: Malaysia’s Hong Leong Group property arm, GuocoLand (China) Ltd (GLC), was voted the Best International Mixed-Use Development at the International Property Awards here over the weekend for its US$2 billion flagship project Guoson Centre. The achievement sets an important milestone for China as it is the first time that one of its mixed-use projects has been honoured for "Best International" in 16 years since the awards’ inception, GLC said. “Winning the world’s best means we have reached a certain point namely world recognition of the efforts that we have put in,” she told reporters from Malaysia and Hong Kong here Sunday. GEORGE TOWN: Mah Sing Group Bhd will apply for approval to take over the planning permission for the Tropika Ferringhi project given to the previous land owner. Mah Sing said in a statement that on 22 November, the group had acquired a piece of freehold land in Batu Ferringhi which had been approved by the authorities for residential development as applied by the vendor from an earlier submission. “The premium has been paid and a development order procured for landed development (Phase Two) for the project named Tropika Ferringhi. Subject to authorities’ approval, Mah Sing intends to rebrand the project ‘Ferringhi Residence@Penang’ upon completion of the sales and purchase agreement. ”Mah Sing will be applying to the MPPP for approval to take over the planning permission upon completion of the land purchase,” the statement said. Mah Sing was responding to an MPPP statement which said that the group had not submitted any application for planning or development approval for the Ferringhi Residence@Penang project. Mah Sing had said the group would unveil its RM800mil residential project on a 61-acre site in Batu Ferringhi in the first quarter of 2011. Group managing director and chief exe-cutive Tan Sri Leong Hoy Kum said the pro- ject would be a gated and guarded scheme, comprising property such as semi-detached and bungalow homes as well as condominiums. UEM Land Holdings Bhd is selling 8.09ha in Johor to Medini Iskandar Malaysia Sdn Bhd for RM6.53 million. Medini plans to build water supply reservoir, suction tank, pump house and retention pond on the land. The sale will provide a gross profit of RM2.86 million for the year ending December 31 2010, UEM Land said in a filing to Bursa Malaysia yesterday. MAHAJAYA Bhd is buying 3.79ha of land in Cheras, Selangor, for RM15.52 million. 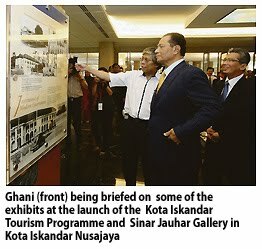 The land will be used to extend the development of its Bandar Damai Perdana, the company said in a statement yesterday.